Depending on where you live, the water from your shower may contain chlorine as well as other chemicals. Toxic metal salts, mineral deposit, pesticides and even hormones may also be found in your tap water. Different cities around the world have different kinds of water and if you want to take your skincare and hair care routine to the next level, a shower water filter may be just what you need. Though most of the chemicals found in tap water are used to treat it and get rid of bacteria and other microorganisms, there’s no denying that they can still be harmful for your health. Chlorine can have a harsh, drying effect on hair and on skin and, along with other chemicals, it can enter the skin through dermal absorption and inhalation which is why it’s important that you get the best shower head water filter for your home. Even the best shower head isn’t worth anything without a good shower head filter. A great shower head filter can be used as a great alternative to a pricier whole house water filtration system (if you'd like to read up on something like that, please check this out RIGHT HERE). It will certainly be more affordable, easier to install and just less of a commitment in general. Having one installed will give you the peace-of-mind of knowing that ​your family won't have to worry about unnecessary exposure to chemicals and other toxins in regular tap water. Keeping all this in mind, we've put together some of our favorite shower head filter products for your browsing pleasure. Hopefully, this list will help you pick one out for your own home! Here are 15 Great Shower Water Filters For Sale Online. Last update on 2019-04-23 at 19:35 Product prices and availability are accurate as of the date/time indicated and are subject to change. Any price and availability information displayed on [relevant Amazon Site(s), as applicable] at the time of purchase will apply to the purchase of this product. Granular Activated Carbon filters and KDF (Kinetic Degradation Fluxion) filters. Granular Activated Carbon filters are best known for reducing synthetic chemicals in the water and absorbing chemical contaminants. KDF (Kinetic Degradation Fluxion) filters change chlorine into a harmless compound through an electrochemical process. It is also bacteriostatic so it prevents the growth of bacteria and does not contribute to the growth of fungus and mildew. If you’re looking for a chlorine shower filter at an unbeatable price, you have to try the 200% Pressure Shower Head 30% Water Saving Ionic Shower Filter Chlorine Filtration Showerhead for Dry Skin & Hair. The handle on this shower head filter connects directly to a standard 20mm shower pipe so installation is a breeze. Aside from purifying the water from your shower, it also features bioactive stones that help restore the balance in your oil glands so you get smoother, less oily skin with it. 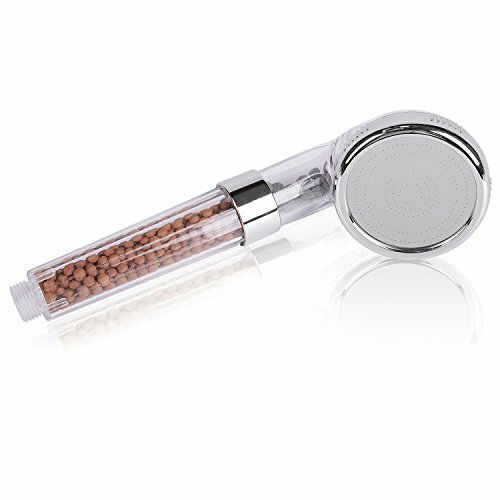 As the name suggests, this shower head water filter also boosts water pressure, thanks to its laser perforated holes technology. This makes it an ideal choice for those who live on the top floors of high rise buildings and older houses or just those in general who live in places with problems when it comes to water pressure. 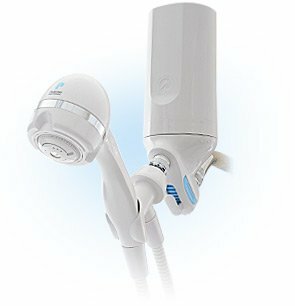 It only uses 1.45 GPM (gallons per minute) compared to the standard 2.5 GPM from regular shower heads so it really eco-friendly and pocket-friendly, too! 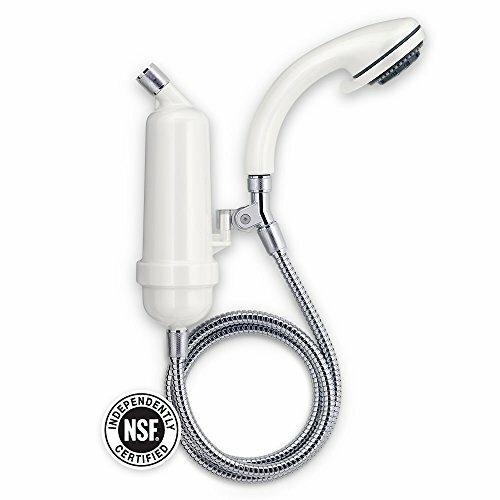 The Culligan WSH-C125 Wall-Mount 10,000 Gallon Capacity Filtered Showerhead is an NSF Certified patented shower head filter that can reduce the chlorine in your tap water by an amazing 99%, reducing problems with sulfur odor and scale. It is very easy to install (comes with the required Teflon tape) and does not require tools for installation so you don’t need to pay extra for installation fees. It also features anti-clog rubber spray nozzles that guarantee safe, long-lasting use as well as refreshing, chemical-free and even mists with every shower. It has 5 spray settings you can manually adjust that range from a full body spray (for maximum water coverage and optimal cleaning) to a relaxing and invigorating pulse (perfect for end-of-the-day showers). This product has a 10.000 gallon filter capacity which means that you will need to replace it after approximately 6 months, as with most shower shower filters. 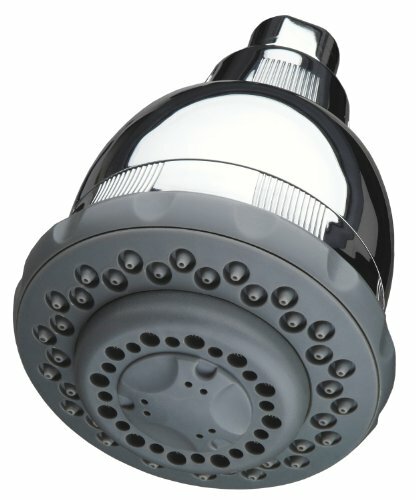 For a fair ticket price, you can get one of the best shower filter shower heads out there and from one of the leading manufacturers, too, no less. The Sprite Shower Pure All-in-one 7 Setting Filtered Shower Head Shower Filter has a chlorgon media that reduces the amount of chlorine, sediment and metals in your water which also results to less odor from your tap. It boasts of 7 different settings to choose from that can really take your showering experience to the next level. 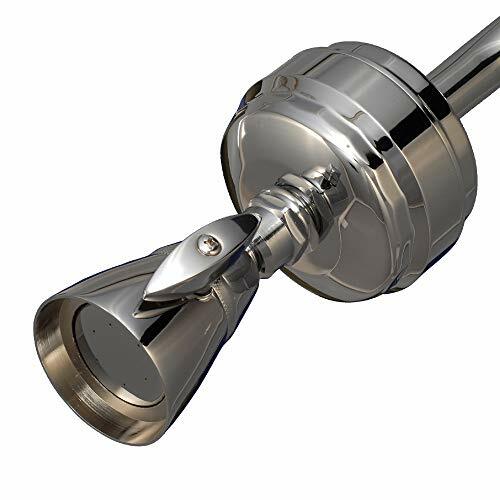 The anti-scaling spray tips allow for easy cleaning and the brass swivel-ball feature guarantees durability, making it a great everyday shower companion. It has the standard 10,000 gallon filter capacity and a replaceable showerhead filter cartridge that comes in both regular (10,000 gallon capacity) and extended (15,000 gallon capacity) that you can opt for if you want a more practical and budget-friendly option. With most shower filters being made out of plastic these days, it’s nice to find one made of durable material such as brass. The Sprite Showers SLB-PB Slim Line Brass Shower Filter Water comes with a 5-year manufacturer’s warranty which assures you that you don’t have to worry about blowing up cash for several different shower filters for a pretty long time. This filter has a low-key, minimalistic design that complements most bathroom metal fixtures. It adds a ritzy vibe which is nice if you want something that will take the level of sophistication in your bathroom up a notch. Aesthetics aside, this product has a filter capacity of 5,000 gallons – only half as much compared to standard water filter for shower fixtures. It does come with one free replaceable filter model SLC, though, that you can either to replace the original one after reaching its maximum capacity or with other Sprite shower filter cartridges that you may already have in your home. This shower filter installs in between the shower head and the shower arm. Installation can be a little tricky with this one so it’s best to seek the help of a professional or at least someone who knows his way around shower filters. 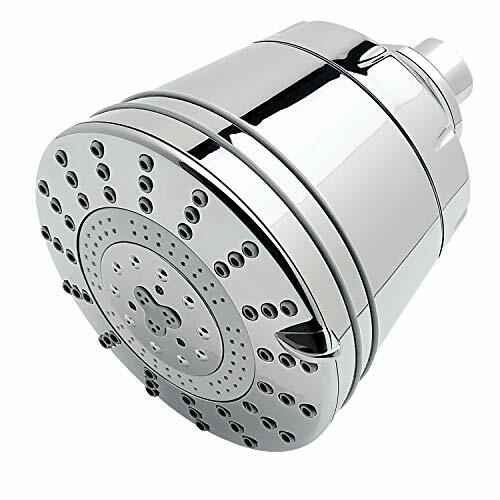 One of the easiest ways to tell if a shower filter is worth buying is if it is certified by the NSF and the WaterChef® SF-7C Premium Shower Filter System is one of them. 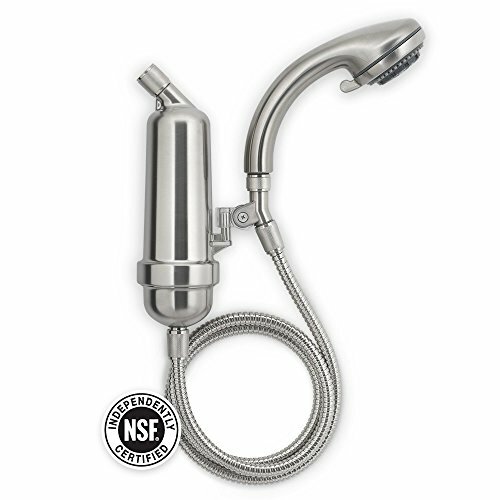 This wall-mounted shower filter system includes a housing made from high-impact ABS and metal fittings, a stainless steel flex hose that’s durable and kink-free and a deluxe shower wand that can be used in both stationary and handheld positions that features 5 adjustable spray pattern settings, including a relaxing pulsating massage speed and anti-clog rubber spray nozzles. This shower filter system uses a two-stage system with ThermalGuard™ for unrivalled chlorine reduction and superior water softening. It’s very light (at only 2.7 lbs) yet very durable and it comes with a pre-installed cartridge so installation is a breeze. It also comes with the standard 10,000 gallon filter capacity and a three-year warranty. If you’re looking for something that looks a little more posh, you can also check out the WaterChef® Premium Shower Filter System SF-7C in brushed nickel. Instead of plain ABS, the housing on this shower filter system is plated with brushed nickel which gives it a sleeker look. It is slightly smaller in dimension and lighter at only 2.2 lbs but it does have the same features of the regular (white) WaterChef® Premium Shower Filter System SF-7C including easy installation, the two-stage water filtration system with ThermalGuard™ and 10.000 gallon filter capacity. It is also NSF certified and it has a full three-year limited warranty from the manufacturer as well. The Sprite Showers HOB-ORB High Output Brass Shower Filter Water is a high-output shower filter in all-brass housing with a jeweled oil rubbed bronze finish. It has a reversible filter cartridge with both sides featuring a 10,000 gallon filter capacity (20,000 gallons total) that will filter your water for a full year. It claims to be the strongest replaceable shower filter available in the market so far and shower filter reviews for this product can back up this claim. This shower filter efficiently and effectively removes chlorine and other chemicals and contaminants in your water and does a great job at softening it so you have clean, odor-free water and softer hair and smoother skin after every shower. This shower filter does not come with a shower head but it installs between the shower arm and existing shower head easily and lasts for a good amount of time. If you happen to live in an area where the water quality is no good at all, you’ll want to get your hands on a very powerful water filter system like the Sprite Industries SLBPCA Shower Filter and Showerhead. This kit comes complete with the water filter and matching adjustable showerhead, both fitted in chrome for a modern look that will easily blend in with all the other existing fixtures in your bathroom. 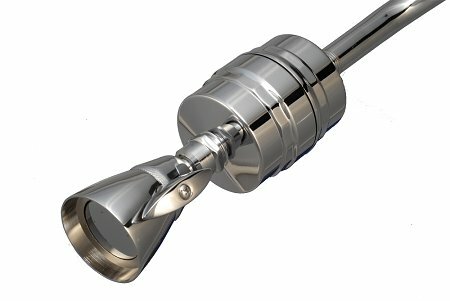 The all-brass housing and chrome polished finish helps the system last longer as it helps avoid tarnishing and rusting. This water filter uses both KDF and chlorgon filtration technology to not only reduce the amount of chlorine, chlorine vapors, irons, traces of heavy metals, odors and other chemicals and contaminants in your tap water by 98%, but to also balance the pH levels, making it safe for the body in case of ingestion and perfect for those who have kids in the house. The filter cartridges are easy to install and can last up to 6 months with regular use and can be easily replaced. Not everyone wants to deal with a bulky shower water filtration system and if you’re one of them, then you’re better off with a filtered shower head or a shower head with filter built in instead. 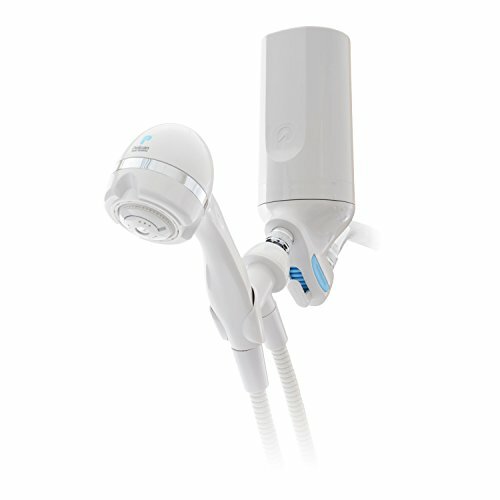 The T3 Negative Ions Pure Water Source Showerhead is a great filter shower head and is one of the best in the market. The showerhead itself has 8 astonishing spray settings that range from gentle rainfall to tension releasing massage. It also has low-maintenance spray nozzles that resist scale build up for easy and effortless cleaning and maintenance. Installation is easy and does not require the use of any tools. Like most water filters, you will need to replace it every 6 months for optimal results. One thing to note about this water filter shower head, though, is that it does not work very well if you already have low water pressure in your home. 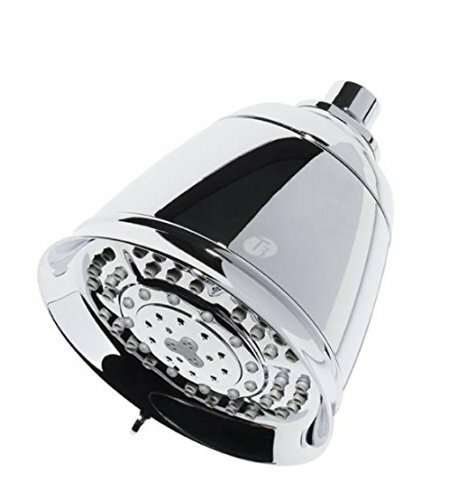 If you prefer hand-held showerheads more than the stationary ones, check out the T3 Bespoke Labs Source Shower Filter Hand Held Shower Head Model 73303. This shower head comes with a filter that can help reduce the amount of chlorine in your water as well as other unwanted deposits that make water hard. It works great with well water is perfect if you have problems with hard water leaving a film / residue on your hair. The filter will last up to six months and can be replaced. Installation and replacement are easy and can be done in a matter of minutes. It doesn’t weaken water pressure but does not help boost it as well. This is an ideal product if you already have good water pressure in your home and all you really need is a water filter. If you’re having trouble finding a water filter that matches your showerhead, it’s best to get a kit that has both so you don’t have to worry about having mismatched fixtures in your bathroom. 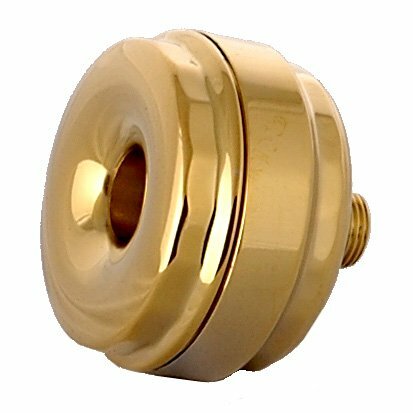 The Sprite HOB-ORB-A Brass High Output Shower Filter - Oil Rub Bronze With Showerhead comes with both a filter and a shower head that easily attaches to the standard shower arm. It features a reversible filter cartridge that has a 20,000 gallon filter capacity that will let you go a full year without replacement which can help save you some cash. The all-brass housing and oil rub bronze finish gives it a brilliant, polished look and helps it last for a long period of time. The shower head is stationary. Aquasana is one of the leading brands when it comes to shower fixtures and accessories so if you’re looking for a shower filtration system that will give you your money’s worth, take a look at the No products found.. It comes with a filter cartridge housing, a flexible hose and a handheld massaging shower head with an adjustable swivel collar for easy use. This shower head with filter system kit is great if you want something that will last you a long time and if you don’t want to bother with replacing the whole system in the future as all you will need to replace with this is the filter (sold separately) for optimal results. It uses a 2-stage filter that removes chlorine, enhances the pH balance in your water and removes synthetic chemicals. Depending on your budget, you might think that this water filtration system’s price is a bit steep but it’s actually worth every penny as it’s not only an investment for your hair and your skin but a great investment for your health as well. Take your showering experience to the next level by opting for the Pelican Premium Shower Filter Combo. This kit comes with a premium shower water filter, a five-foot tangle-free massaging wand a replacement filter and six scent bars that will help make your shower more relaxing and refreshing. While most shower filters remove only chlorine from your water, the Pelican Premium shower filter combo can also remove up to 96% of chloramines in your tap. It also boasts of a 15,000 gallon filter capacity which is bigger than the standard 10,000 gallon filter capacity. It is easy to install and does not require the help of a pro and although it does not claim to boost water pressure, many users apparently enjoy stronger water pressure with this kit. We all want to get the best bang for our buck and the Pelican Countertop Drinking Filter and Shower Head Combo lets you do just that. This combo comes with the Pelican Premium 3-stage Shower Filter and BPA-free showerhead and water filter for shower that filters up to 15,000 gallons of water and the Pelican Countertop drinking filter which can filter up to 450 gallons of drinking water. Both filters are designed to eliminated chemicals and contaminants from your tap water. The shower head has a dual-flow feature that allows you to switch between high-flow and water conservation while the drinking water filter features an LED filter life indicator so you know exactly when to change filters. Both filtration systems are easy to install and operate. Some people take water filters more seriously than others and if you are one of them, you should definitely check out the WaterChef® Premium Shower Filter System SF-7C in polished brass. This set comes with a filter cartridge housing and deluxe shower head wand both in polished brass for an elegant and sophisticated look and durable and reliable quality. The filter utilizes a 2-stage filtration system with ThermalGuard™ to efficiently remove and reduce unnecessary and unwanted chemicals and contaminants in your water. 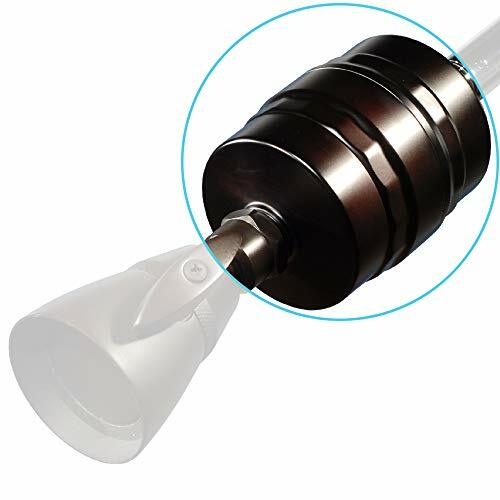 The deluxe shower wand features an adjustable spray with 5 different settings that include a pulsating massage as well as anti-clog rubber spray nozzles that make clean up and maintenance a whole lot quicker and easier. This system is NSF tested and certified and comes with a 3-year warranty so you know you are getting every penny’s worth. It also comes with a pre-installed cartridge with a 10,000 gallon filter capacity that makes installation easier. Shopping online is incredibly fun (with all the choices and pleasantries of the modern internet age) but the sheer amount of options can become incredibly difficult to wade through. ​We hope this list has given you a good starting point to finding yourself a great shower head water filter product for your own home and situation. Like all of our lists, these products have been curated from hundreds of other options. We use user ratings and approval scores and make sure that the items we feature have been tested by plenty of happy customers. This is how we deliver you the best quality water filter products available on the net.